MEC 97 is a configurable power distribution unit produced with the printed circuit board (PCB) logic, where all relays and fuses are assembled on the PCB top side using press-fit technology. This is an innovative solderless process to insert terminals on the printed board that ensures optimal electrical contacts even in the presence of strong vibrations. MEC 97 allows to integrate all the functions in one piece, thus eliminating the need of different modules and associated wirings. 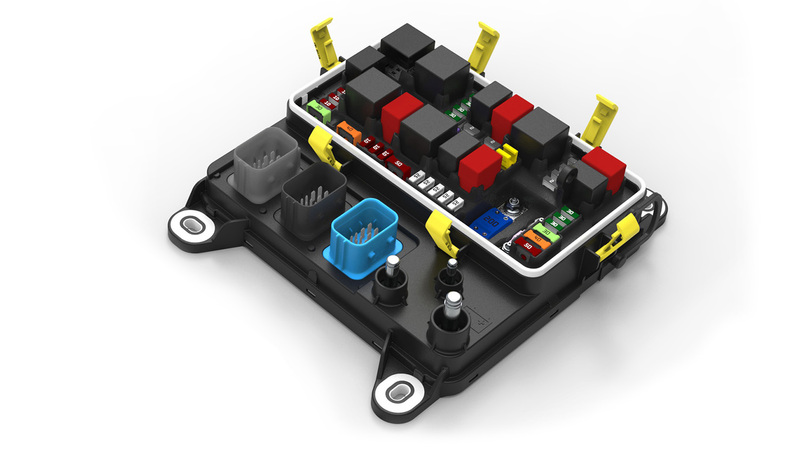 The vehicle is therefore lightened from costly and heavy modules and cables, the wiring layout is simplified and the assembly time reduced. MEC 97 comes with 4 different customization levels, with upper and bottom covers remaining standard through the range. In the basic level – called Soft –customers can choose various ranges of relays or fuses, which are all plug-in components. 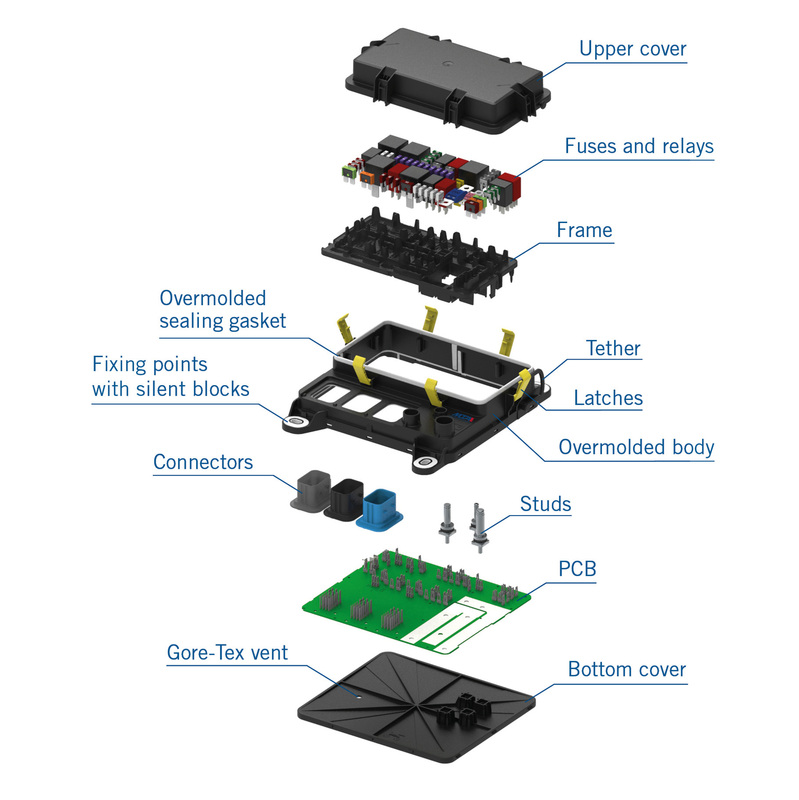 The Medium configuration comes with a customizable PCB, while in the Medium+ the frame, hosting relays and fuses, can be personalized too, making the unit a highly versatile product. In the High level the number of studs and connectors can change depending on customer’s needs. MEC 97 comes equipped with an anti-vibration system integrated inside the fixing points, to assure high mechanical and electrical performances in severe applications and to avoid to OE Manufacturers the need to mount silent blocks. The fuses and relays are housed in a sealed compartment that protects the components from dust and water. Protection is also ensured by: a Gore-Tex vent that allows free air circulation in the unit and avoids the formation of moisture; an overmolded sealing gasket; 6 latches which preload the cover against the seal and close the MEC 97. These characteristics ensure an IP69k protection degree for the high demanding environments where the targeted machines operate. Moreover, the cover is tethered to the body to ensure it won’t be displaced during assembly or maintenance. All the above characteristics, combined with compactness, make MEC 97 also perfect for use in the engine compartment, where it can be positioned horizontally, vertically or inclined, thereby taking maximum advantage of the available space. MEC 97 is compatible with both 12 V and 24 V electrical architectures and, upon request, can host a module to convert CAN BUS messages into digital outputs. Press Release – MEC 97 Power Distribution Unit.